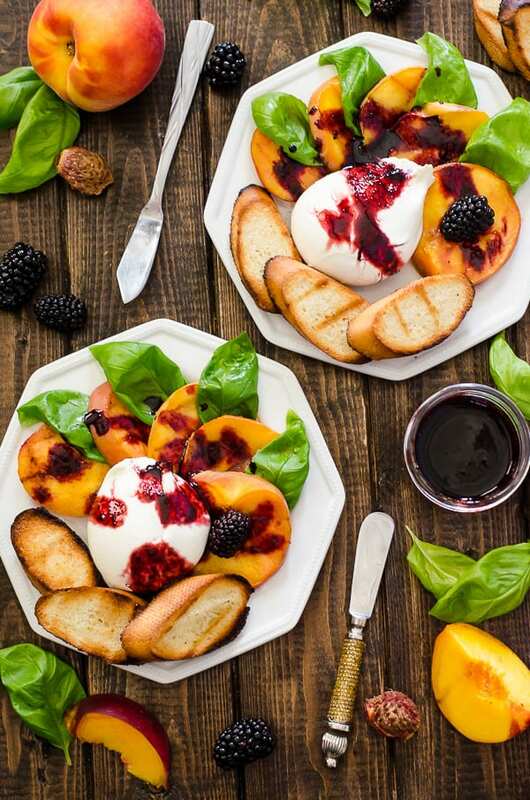 Transform a favorite Italian salad – Grilled Peach Caprese combines fresh peaches, burrata, basil, and blackberry balsamic into a perfect summer day appetizer! My favorite fruit has been a hard thing to nail down. For the longest time, I swore it was the orange. I ate and drank so much of them, I probably had enough vitamin C for two people running through me at any given time. In the last ten years, though, I’ve had love affairs with pineapple, cherries, grapes, apples, strawberries, pomegranate. Each fruit managed to weasel its way into my heart and kitchen, and they’ve rotated their way through being a star in my cooking and baking. Now here we are, Summer of ’16…and peaches have been most plentiful in the Crumby house. Mr. Crumby and I are both very active in the kitchen, sometimes fighting over who’s cooking dinner. (Yeah, be jealous, ladies.) I always considered the oven to be my domain, however. I left the grilling to him, but it seems like that’s become my domain this summer, too. The desire to grill has been strong in me, so much so that we’ve already gone through two full propane tanks since mid-May. Grilled fruit is a bandwagon I just recently (liiiiiiiike last week) jumped on, but the appeal is obvious once you’ve tried it for yourself. There’s nothing wrong with taking the natural sweetness of a favorite fruit and elevating by giving it a little bit of a different flavor. You know…summertime, Sunday afternoon in the backyard, smell of sprinklers watering the hot humid grass, tongs in one hand & a beer in the other flavor. So far, all of my attempts have been gas grilled, but I’m really looking forward to giving some of the bourbon barrel chips I bought in the spring a try. Imagine the possibilities! 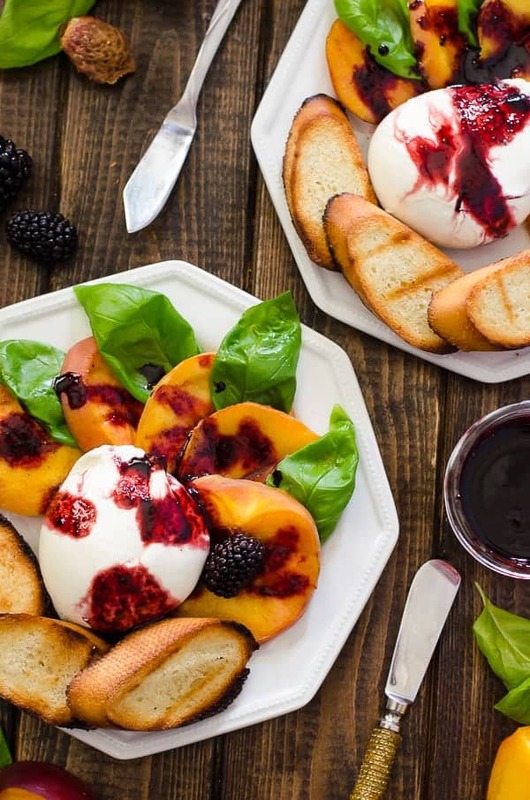 So, why caprese with peaches? I promise, they don’t bastardize the caprese. Classic caprese is my faaaaaaaaaave salad in the world, (really, what’s not to love about tomatoes and cheese?) and while this variation could never replace the original, it’s absolutely up there among dishes I’d eat on a weekly basis. 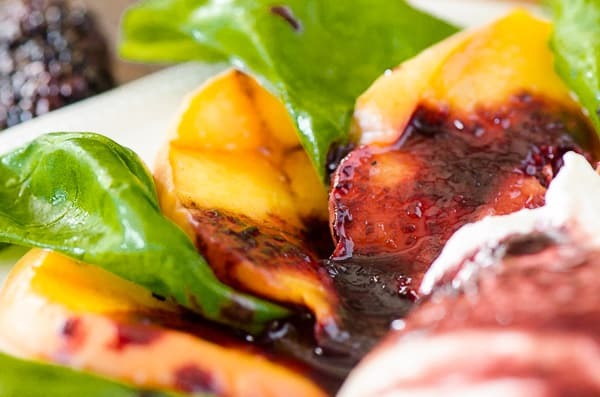 The peaches are less acidic than tomatoes, but the balance is brought on by the homemade blackberry balsamic reduction. Which is so good, I couldn’t keep myself from licking the spoon. Honestly, I would drizzle it on everything if I could get away with it. If anyone wants to send me some blackberries from their backyard, I’d happily make a huge batch to last me all winter. I might even send you some back. 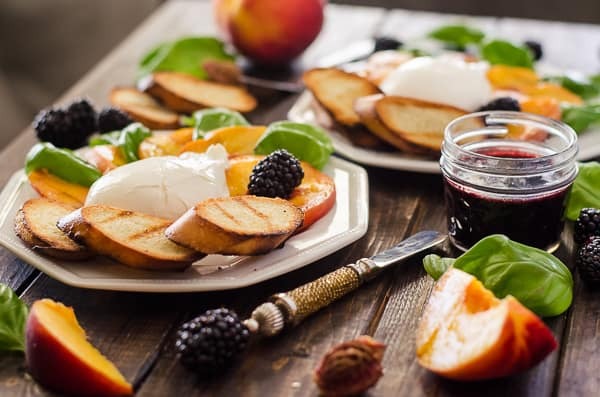 I can happily say that the basil used in this grilled peach caprese recipe is from my very own little backyard garden! You might recall last summer, when I was gushing about my zucchini plant and how it was sprouting? And then it died in August, and only bore like two actual zucchini, neither of which got big enough to use? Yeah, so my green thumb hasn’t really improved – I’ve only had a few wins (I blame Florida heat, mostly,) but this basil is the biggest win of all. It’s suffering a bit right now thanks to the high temps and little rain we’ve had, but it’s still going strong! Strong enough to bear me some perfect leaves for cocktails and caprese. Thanks heavens, because basil is pretty much the best herb ever. And a recipe including cheese wouldn’t be complete if I didn’t rave a bit about it, right? BURRATA!!! Insert a million heart eyes emojis right here. If there’s one cheese you have to try in your life, it’s this one. Mozzarella inception, blessed by a little cream that turns it into a perfect food. I fell in love a year ago and haven’t turned back. 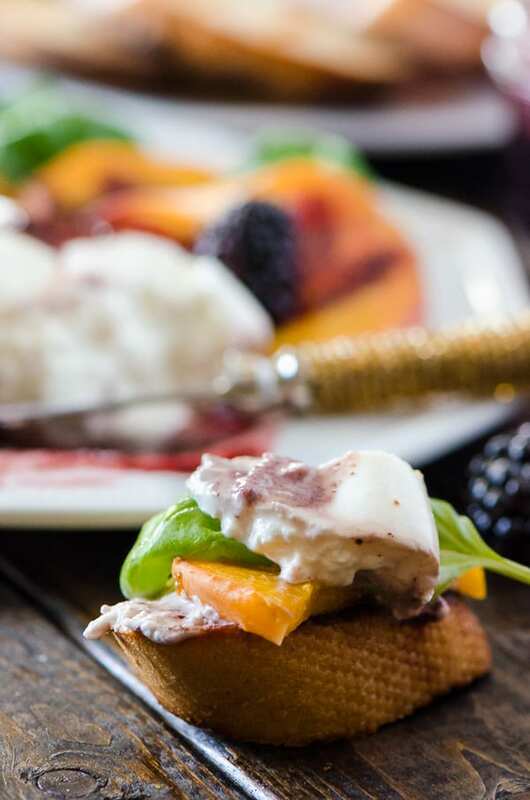 I’m looking for more reasons to work burrata into my life, and I’m taking suggestions. Not that I NEED reasons, it just feels better to not eat it straight from the container like a barbarian. Lightly brush grill with olive oil, then preheat on medium flame. Brush both sides of peach slices with olive oil. 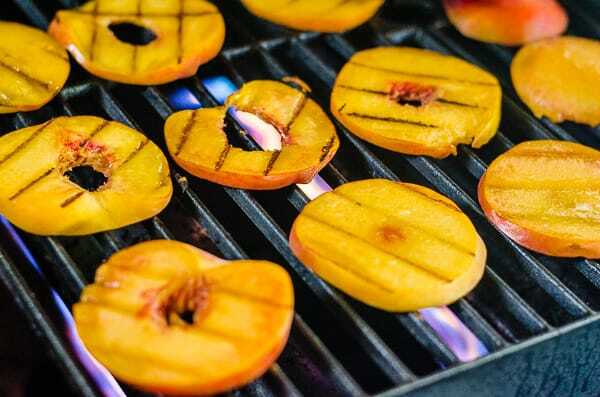 Place peach slices on grill, grilling each side for 1 1/2-2 minutes, until grill marks appear. Place on paper towel-lined plate to cool. Brush baguette slices with olive oil on both sides. Grill each side for 2 minutes. Remove and set aside to cool. Place water and blackberries in a small saucepan set over high heat. Bring to a boil, macerating berries with a potato masher or back of a large spoon. Reduce heat to medium and cook for 7-10 minutes. Set a fine mesh strainer over a small bowl. Pour berry sauce through strainer, pressing the solids to extract all the juice. Discard solids and return juice to saucepan. Place saucepan back on heat and add balsamic vinegar. Allow to boil 5 minutes, then reduce heat and simmer for 10 minutes until sauce has reduced and thickened. Cool and pour into a small bottle or jar. 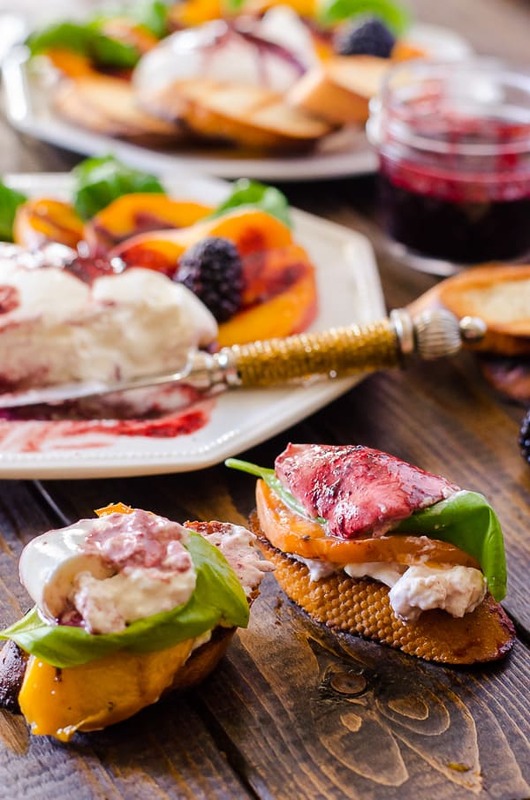 Arrange peach slices and basil leaves alternately in a semi-circle on a plate. 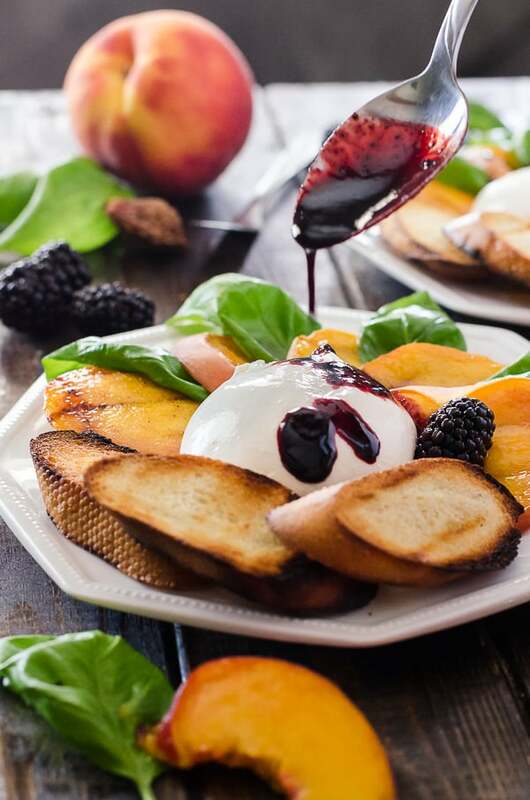 Place a ball of burrata in the middle, then drizzle with blackberry balsamic. Serve with grilled baguette slices. Enjoy! 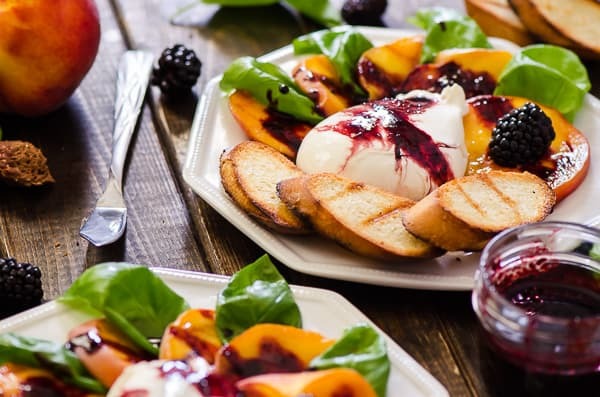 Peaches are the perfect summer fruit – and there are so many ways to enjoy them! 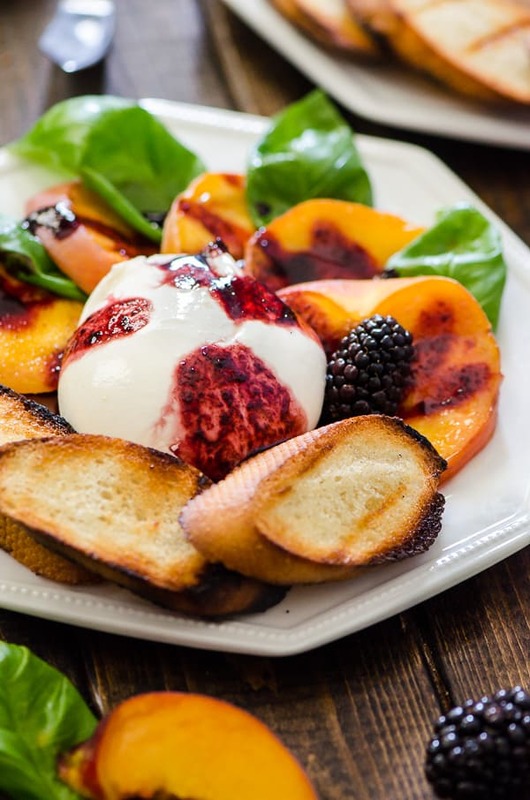 PIN THIS PEACH CAPRESE SALAD FOR LATER! what a delicious take on Caprese! I ate a Caprese salad in nearly every city we visited in Italy, but I would have been just as thrilled with this peach version! Stunning appetizer! I can’t wait to gobble up all the caprese in Italy someday!! Did each city version have a different taste, I wonder? I can’t ever pick a favorite fruit. I was so into bananas for the longest time, but now I love peaches and cherries and blackberries and pineapple and pretty much all the fruit. 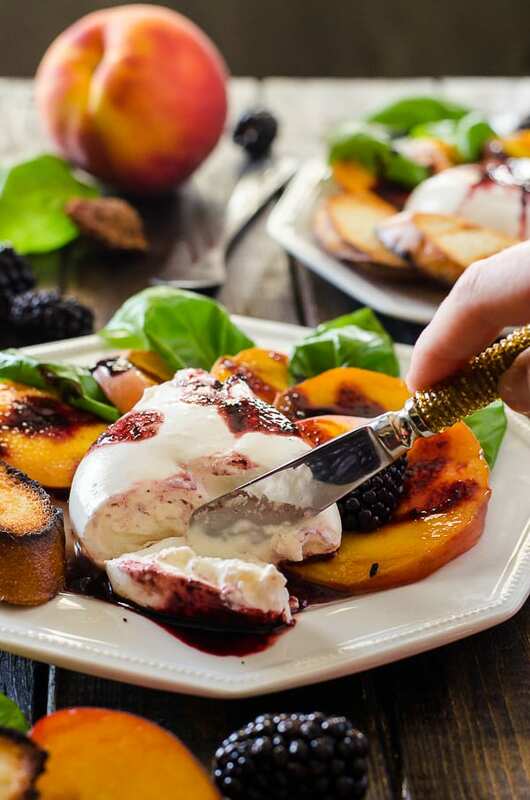 Fruit pairs so well with balsamic. Oh, I’ve always loved bananas for their versatility, but they were never my favorite. But yes! All of those fruits are just <3 aren't they!? I love this twist on the Caprese salad, and it is stunning to look at. What a great take on one of my favorite dishes! I can’t wait to try this. Thanks for the inspiration!!!! These have my name all over them! What wonderful little bites of deliciousness! Lovely presentation! 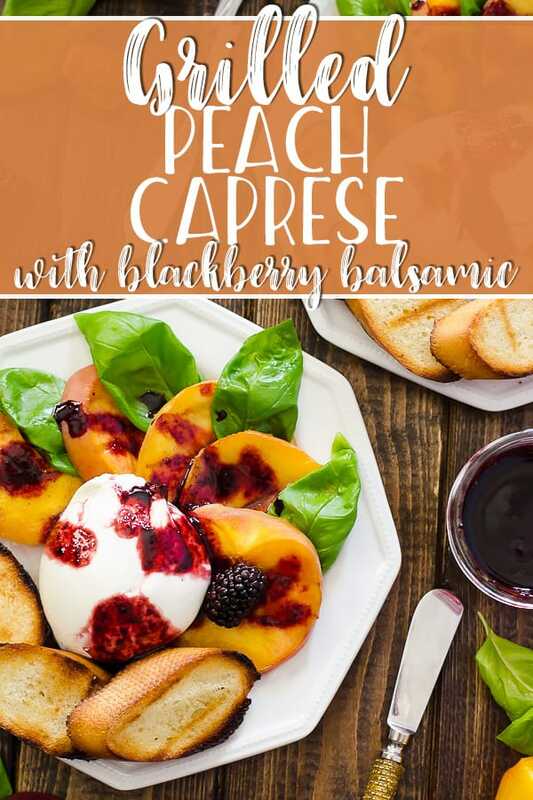 This sounds like a delicious way to make caprese!